The Omaha poker tool calculates accurate poker odds, pot odds, number of outs and table position for regular Hi games and Omaha Hi Lo. Omaha Indicator shows HPoints also known as Hutchison Points which evaluate preflop hand strength, H-Points were invented by Edward Hutchison in 1997and are used specifically for Omaha Poker. Edward Hutchison wrote an article in Canadian Poker Monthly detailing a point count system that could be used for Omaha poker to determine your chances of winning based on several factors. Omaha Indicator also ranks Omaha starting hands by groups Top 10, Premium, Strong and “Weak to indicate the starting hand strength, it also shows opponent statistics and their betting patterns as the game progresses. Omaha Indicator easy to use HUD calculates Omaha poker odds. Once you become accustomed to all the features that Omaha Indicator offers and the calculations it makes in real time via it’s HUD the Omaha odds calculator simply makes you play Omaha like a pro. Omaha Indicator is an asset to any Omaha player when used correctly, it makes your hand apparent at a glance and provides all the information about your hand and it’s relative strength. Omaha Indicator is my favorite Omaha odds calculator, I use it when I play Omaha even though I’m a pretty pathetic Omaha player, I manage to hold my own with the aid of the tool. Omaha is apparently far more exploitable than Holdem when it comes to playing for money or as a pro. In general people have less of a grasp of the game than Holdem and the advantages of playing Omaha by the correct odds heavily favor the player much more so than in Texas Holdem. Omaha Indicator features automatic player tracking and profiling allowing you to exploit weaknesses in your opponents and can be switched between the current session or the entire history against an opponent providing you with the tools needed to defeat them all. Simple and easy to use Head-Up Display (HUD). Poker calculations made: Win Odds, Pot Odds, Hand Odds, HPoints, Group,OUTS and position. Player statistics and automatic profiling of opponents. Alert when you have the nuts. See mucked opponents hands at showdown (only some rooms). 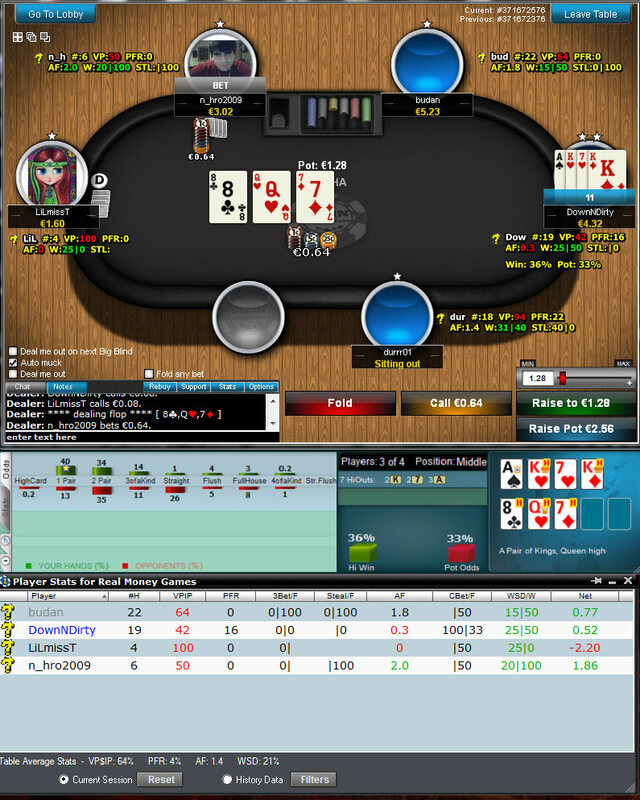 Omaha Indicator’s HUD is simple to use while displaying all the information needed to help you make the best decision while playing online poker based on the accurate calculations the Omaha odds calculator makes in real time. The Omaha tracking software that Omaha Indicator provides is sufficient for most players, its provides easy to read accurate stats about your opponents and their play based on the past hand history. The following are all tracked by Omaha Indicator’s software. VPIP – Percentage of Voluntary Money Put In Pot. PFR – Pre-flop raise percentage. 3Bet/F – 3Bet pre-flop raise percentage and fold to 3 bet percentages. Steal/F: Percentage that a player raises an unopened pot pre-flop from Cutoff, Button or Small Blind position and how often they fold to such a play. CBet/F Percentage of continuation bet on flop and fold to c-bet. WSD/W – How often the player went to showdown and percent win on showdown. Net – Net win and loss displayed. Neutral, Aggressive, Solid. Neutral, Passive. Slightly Loose, Neutral. Rock (Tight, Passive, Solid). Slightly Loose, Aggressive, Solid. Tight, Aggressive, Overplay. Tight, Neutral. Tight, Passive, Overplay. Omaha Indicator software supports over 300 poker rooms and covers Limit, No Limit, Pot Limit ,Omaha and Omaha Hi Lo games, including both Tournament and ring games. Below is a list of some of the networks and poker rooms supported. Omaha Indicator software usage is approved by all popular poker rooms and is an allowed poker tool for PokerStars. Omaha Indicator licenses can be purchased directly for the price of 79 Euros directly from the poker tool developer, payment options include Paypal, moneybookers or credit card. The license includes a life-time license for Omaha Indicator with unlimited usage, never pay again even for new updated versions and 24/7 Customer Support. Omaha Indicator certainly is one of the best Omaha Odds Calculators due to its uncomplicated easy to use features, allowing you more time to concentrate on your game while still performing all the calculations on your odds seamlessly. We highly recommend this Omaha Tool and for the price including a lifetime of updates makes this poker odds calculator good value for money.